Disney Art Doll Swap on Two Peas in a Bucket. I just sent these to Iowa to be swapped out. 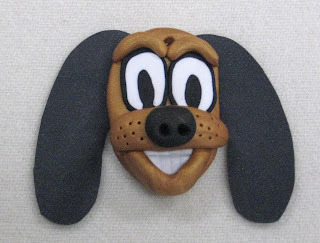 This is my Pluto made with Fimo clay. The swap required one found object in it, so the ears are made of rubber pond liner. I, at first found a black rubber tubing on the beach on Vancouver Island, but did not bring enough home. Then I remembered I had water garden pond liner left and it would work great. I was pleased that the golden dog looks more like Pluto then I ever thought I would achieve. My kids even saw Pluto when I showed them. I have been playing with Fimo clay for more than 15 years. The next pendant is Elizabeth Swan, female pirate. I found beer bottle caps to use around her face, for the require found object element. Some of them were also found on the some beach and some on my kitchen counter. I thought Beer caps for the pirate was good ( only Rum caps would have been better, maybe if I was at Uncle Dave's, I might find them). I made Fimo faces and Fimo beads for hands and feet. She has a purched pirate sword, a tiny skull charm on her shoulder (photo not showing this) and a compose made of Shirk Dink stamped and a spinner in the centre. Her hair is cotton thread, saved clipping from quilting a customer's quilt ( I never throw that out, may need it some day), so each doll has a different colour hair. If there had been a recycle requirement I would have fulfilled that too. Her dress/body is a quilt sandwich of different black and white fabrics. It is ruff edge cut out of a larger quilted piece. I sew through the dress/body to attach the hair then the leather cord for arms and legs. In the back is a leather cord with a jump ring so that she is a pendant. I have sent a pin that could be added to the back side if any of the ladies want her to be a pin also. I planned for mine to be a pin. She is a little large for a pendent. Wow did you get all that. 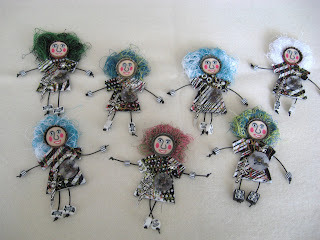 I have been making little fabic doll pins for years. 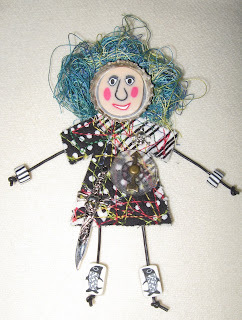 I have been calling them Thread Head Doll Pins. They too have the faces and bead hands and feet, and the hair. So to make one that was a "pirate" was all that I had to work out, and add the pendant attachment. Here is the group of seven of them that I sent. They all have there own personalities. Look at all of this fun stuff! You do great work!